Good News for all SSC CGL 2013 aspirants! 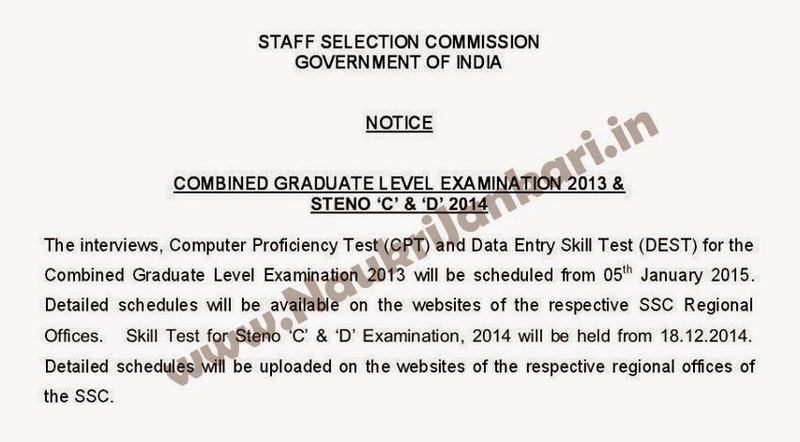 Staff Selection Commission has issued today an official notice about the CGL 2013 interview and computer proficiency test. They are going to conduct interview, data entry skill test (DEST) and computer proficiency test (CPT) for all interview and non-interview posts from 5th January, 2015. A month ago, SSC has issued an advertisement regarding the postponement of interview and skill test for CGL 2013 recruitment exam. Now finally the postponement has been withdrawn. So friends, on the eve of new year, a little gift for you! Time to prepare well for the interview and skill test. Good Luck! 0 comments for " SSC CGL 2013 Interview, CPT & DEST to start from 05.01.15 "